So many people are obsessed with KonMari. This book and the tidying system it describes has been popular in minimalist circles for a long time, but it suddenly exploded into the mainstream this week when Netflix posted a series where Marie Kondo goes to individual homes and helps them shift their household into something more minimalist and beautiful. I think every single person is watching this show and ready to talk about it. I called my brother earlier tonight, and HE was watching it! In so many ways, I could not be more excited about this. Can you imagine how many people, in this very moment, are considering how happy their life might be with LESS stuff instead of more? I also agree deeply with so many of her observations. We can buy a lot of things because we simply aren't aware of what we already have. We hold on to things for "sentimental" reasons, but never have any intention of using them or enjoying them. We make half-hearted efforts at tidying, but need to approach the task with seriousness and purpose to really free ourselves from our stuff. I love that this woman is helping people see these things. That said, I have a major bone to pick with Marie Kondo, Kon Mari, and the new show "Tidying Up." She never explicitly tells you what she means by "discarding." She clearly proves that discarding is paramount for our happiness and sanity. But she never points out that how we discard is so important too. It is hinted at here and there, but considering how clear her directions are on how to store your socks, she leaves this whole part of her system relatively under-defined. The way she talks about discarding creates this false sense that once an item leaves your home, it dissipates into the ether and is no longer your responsibility.Her lack of addressing what discarding really looks like reinforces a classic modern myth that you can throw things away because there is an "away." We like to think that once we can't see it, it's gone. But we know that isn't true. Just because an item is out of your sight doesn't necessarily mean that its effect on you is over. In fact, our generation is the first to clearly see how much our trash still effects us. Our trash (especially but not exclusively plastic) is piling up in our waters, contaminating our food sources, harming animals, and even returning to our bodies. Microfiber waste is now in every major water source, and human beings consume it every day. Our landfills are overfull, and there is growing debate about what to do with all the stuff we all tidy out of our houses. The other important part of this is that only having stuff that brings you joy is in itself a privilege. So many people can't afford to discard something because they couldn't afford to replace it. This is good to remember when you are trying to decide what to discard- it could have a lot of use and value to someone else who is way out of Kondo's audience. Ok, I know you think I am being harsh on Marie- she never straight up says throw everything in the garbage! She never says you can't donate or give things away! In fact, in the book, she says "To get rid of what you need is neither wasteful nor shameful. Can you truthfully say you treasure something buring so deeply in a closet or drawer that you have forgotten its existence... Free them from the prison to which you have relegated them." She also says "Giving thing you can't use to others is an excellent idea. Not only is it economical, but it can be a source of great joy to see these things being enjoyed and treasured by someone close to you." She says it can be excellent to give things to others, but then never mentions it again. Instead, she warns against "forcing" our things on others because we are transferring our guilt at not being able to discard them ourselves. I get that suggestion. Some of those things we take to Goodwill maybe could be thrown away, but we don't really see how they can be used again. But we are often wrong. So many things that look like junk to us could be a treasure to others. So I don't think donating or gifting is a transfer of guilt, it can be allowing an object to be open to possibilities you can't imagine. In other passages, she is less clear, calling the discard piles "garbage" and "rubbish. 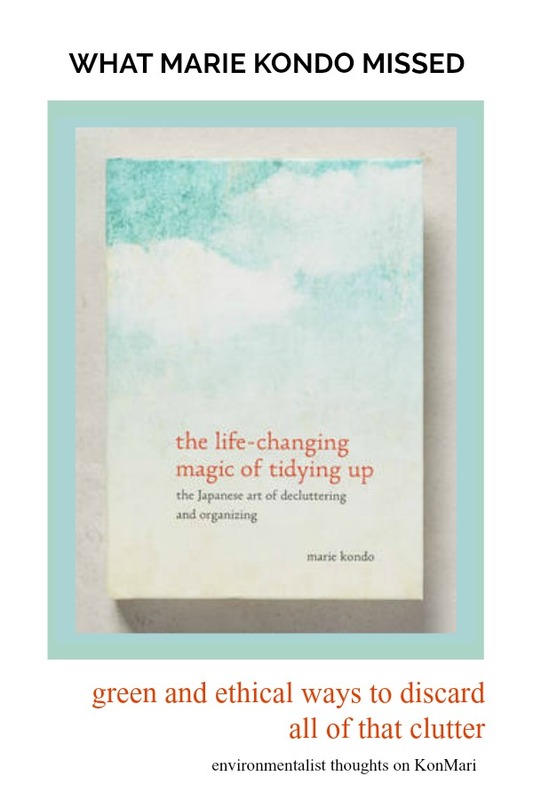 "Kondo stresses that the discarding phase of tidying should be a marathon and go quickly. The goal is to pick quickly so you can have your cathartic sense of true tidiness, and the more you get rid of, the better, no matter where it goes. This is perfectly illustrated in the show. When the family or individual finishes "tidying" an unmarked truck comes to take all the stuff, thrown into bags off to... somewhere. It's not clear (there are a few episodes where a charity is mentioned... but not always). They won't commit enough to admit it is going to a landfill, but it's not clear where it is being donated to either. It just all goes, and they don't have to be responsible for whether its waste or not. 40 or 200 bags to a landfill is not an accomplishment, it is a burden to the generations that come after us. It's not gone, it's waiting on someone else to take care of it. In other words, the hard work is deciding to get rid of what you want is the perfect first step. But that doesn't mean it's the magical ONLY step. That stuff all needs to go somewhere, and that's on you. I am so excited that you are cleaning out your stuff and refocus your life. Seriously, that is dang cool, and everyone benefits if minimalism makes it mainstream. I am just begging you to follow that accomplishment with another one- discard your stuff as ethically as possible. The less that goes to the garbage, the better. The process of discarding may be slower than an unmarked truck coming to take everything away. Yes, one big purge is cathartic and quick, but believing in the quick and easy is what got us into these cluttered messes in the first place. Instead, split your discard piles into things you would like to sell, to give to friends, to donate, to recycle (including terracycle), and the last (hopefully tiny) pile can go to the garbage. Sell things if you think you can and want to. Otherwise, the first step is to offer things to your friends. Don't pressure them- maybe throw a bunch of pictures up on facebook or offer them quietly to someone who is just putting a home together. The other great option is using Buy Nothing. The Buy Nothing Project connects neighbors into facebook groups. In the groups, people can ask for things they need and offer things they no longer want. The best part is that if you offer things, your neighbors really will just show up and take it away for you. We have used it for things as big as a treadmill and as small as a few cans of pop. This project is always growing, so check their page to see if a group exists where you live. Throwing an old blanket away might make you happy, but donating it to an animal shelter can bring so much joy. Getting papers out of your house is great, keeping them out of landfills feels even better. The way we discard what we have can be loaded with giving and donating, with listening to what others need, and with joy. Don't blaze through that phase. We can eliminate even more trash! Check amazing sites like Terracycle to see which "disposable" Komono can be recycled. Once you have gifted everything you can to people you know, look into what is left and where it can be donated. I guarantee you will be surprised! Doing the research for donations and what can be terracycled might take a minute, but you can keep SO much out of the landfill. Do the right thing and discard in a way that protects the Earth from all of this garbage. If it could still be used for anything, share it. Don't toss it. This doesn't mean you can't make your discard pile quickly, but designate a space for it to live while you find new homes for your past belongings. You can even do it stage by stage- Clothes can be donated (even the well-worn items) or consigned, Books can be donated to your local libraries, Papers can be recycled, etc. Things will only get complicated (as they do) when you reach the Komono stage. Rather than setting how many garbage bags get out of our house, set a goal of how much you can usefully and thoughtfully give away. 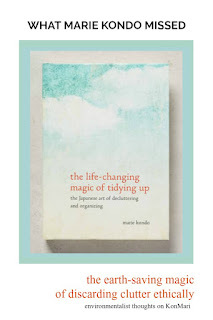 Reorganize your home, brighten your life, and make the Earth a happier and cleaner place. It's a lot for spring cleaning, but you can do it. Here at this blog, our goal is to give 2,019 items away this year, so we can focus on what we keep and what we give to others. We are focusing on responding to the needs of the people around us, building community with our Buy Nothing Group, and sending our stuff to places where it can get more use. 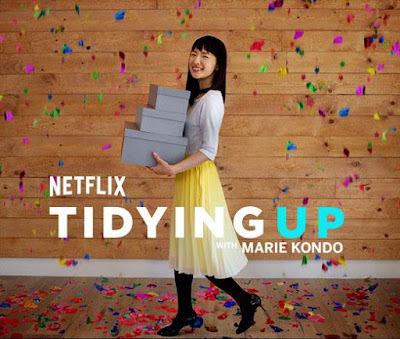 I think Marie Kondo would think that was "an excellent idea," but I wish I could hear more of her process on this. That said, I do think her biggest point that we all need to consume less is SPOT ON and think that the most important thing we can all do is just stop buying so much. 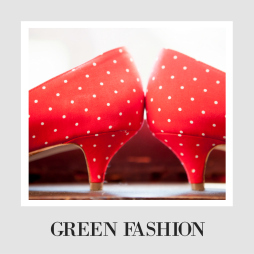 Want more info on green cleaning and minimalism? Check out more of our green cleaning posts or the Green Home Page. I'm confused by the point of your blog....the show shows several people taking their things to donate, they talk about being thankful for their clothes and the life they gave them as well as hoping someone else will enjoy them. When showing Marie what they are discarding they say "this is the donate pile"
This is so true. I have a load of friends becoming more minimalist but then just dump their things as they just want it gone rather than taking the time to sort and donate things! Drives me bonkers so I tend to take their stuff in and donate it myself! YES YES YES YES YES! It's so funny, my post from exactly 4 years 2 days ago (which I was just dusting off this morning for Throwback Thursday) makes the exact same point! It's not just about downsizing our lives - we need to do so MINDFULLY. And this includes thinking of *who can best use our no-longer-needed stuff* so it doesn't end up in a landfill or incinerator! I completely agree with you about this. I've found it troubling that she doesn't really deal with how one is supposed to discard items. Also, it cannot be assumed that putting something in the donate pile is not problematic (e.g., used clothing from developed countries flooding developing countries and preventing these countries from developing their textile industry). We should definitely stop buying.I had exactly the same point and worry about the discarded clothes. I am glad you write this article! I think it's super important to remember that whether you discard or donate (and please donate!!) the MOST vital step comes next- Dont buy more!! 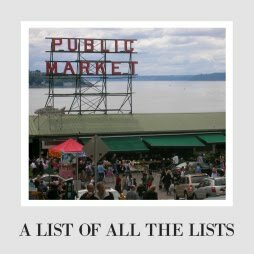 Live with less and just.stop.buying.stuff! This is a great follow up to the show. It never hurts to remind people that their are better options to throwing things in the trash.